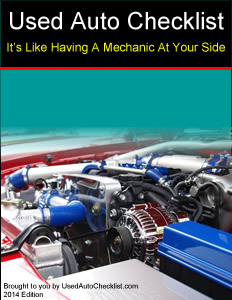 The car, truck, van or SUV should idle smoothly and quietly. Check the warning lights or gauges to see if everything is in order. There should be gauges or lights for at least the following: alternator/ammeter, oil pressure and temperature. If the warning lights are on for any of these, or the gauges indicate problems (low readings for the ammeter and oil or high reading for temperature), the automobile will need servicing. The automatic transmission dipstick is similar to the oil dipstick (see: Section D, Oil). Unless the owner's manual directs otherwise, re-check the transmission fluid while allowing the engine to continue to run. Shift into each gear and end in “P” (park). Pull the dipstick out, wipe it with a rag and put it back in all the way. Pull it back out and check the dipstick. It should read full. If it is low, this could mean trouble. Have the mechanic look at it. The color should be clear or bright red. Dark brown or black fluid that has a burnt smell indicates the need for an overhaul. This is also true if you find any particles or bubbles in the fluid. Press the gas pedal and look out the rear view mirror to check the exhaust smoke color. The engine burns oil if the color is blue. Black smoke indicates burnt valves or problems with the carburetor or fuel system. White smoke (steam) is normal when the automobile is started in cold weather. Watch out for excessive steam out of the exhaust. This indicates a coolant leak. The engine must be warm in order to check the heater. Turn the heater on the highest settings and check all the fan speeds. Check all the vents. Check to make sure the air returns to normal when the heater is off or the temperature setting is at cold. If the weather is warm, turn the air conditioner on the highest setting, both in temperature and fan speed. Check all the fan speeds. Check all the vents. If it is cold outside, have the mechanic inspect it.